Friendly people, beautiful beaches and tasty cuisine are among the reasons why expatriates are choosing Mexico as a place to live. Mexico came in second in a survey of 14,400 people providing feedback on life abroad in 64 countries. The survey was conducted by InterNations, a network and guide for expatriates. For 2015, Ecuador held on to its first-place ranking for its low living expenses, affordable health care, friendly welcome and social opportunities, while Mexico moved up one to claim the No. 2 spot. The cost of living and the ease of settling in overcame concerns over safety, political stability and peacefulness. More than four out of five expats viewed living costs favorably and more than three-quarters were generally happy about their financial situation. Mexico ranked seventh against other countries on the survey’s cost of living index and third in the personal finance index. In terms of happiness, Mexican expats — like Mexicans themselves — rank right up there in third place after Ecuador and Costa Rica. Three out of eight say they are very happy with their lives, almost double the worldwide average of 19%, a sentiment shared by many native Mexicans. The United Nations World Happiness Report put Mexico in 14th place out of 158 countries this year. Other reasons to like Mexico were leisure opportunities and climate, but in terms of overall quality of life its ranking was just 22 as a result of low scores in two sub-categories, travel and transport, and health, safety and well-being. While travel opportunities got a positive rating from 94%, only 56% had a positive view of transportation infrastructure. Personal safety earned a negative review from 24% of respondents, compared to a global average of 11%. Political stability was seen negatively by 29% compared to 16% worldwide, and peacefulness 23%, compared to 10% on a global scale. Despite all that, Mexico has almost five times as many retirees as the global average: 23% compared to 5%. 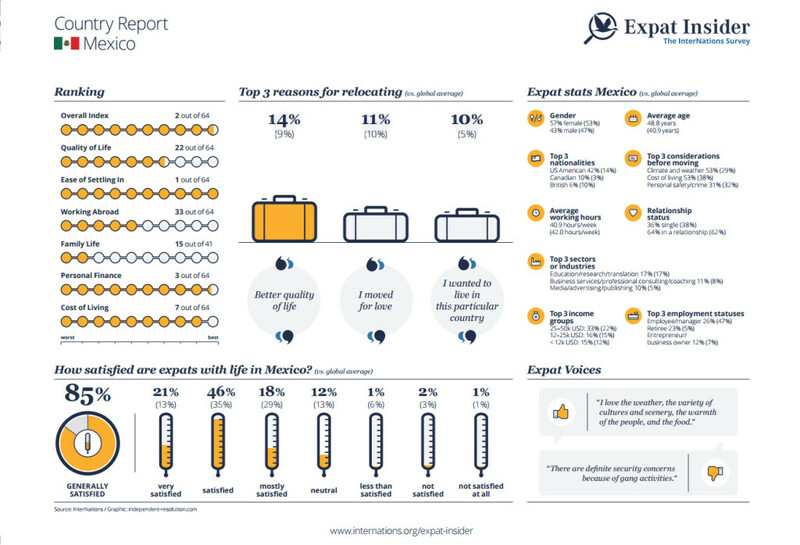 And 41% of expats in Mexico said they will probably never leave. Working expats are somewhat less happy about Mexico due to long hours — on average 47.1 hours a week. Two out of seven expats work part-time and about 12% are self-employed. 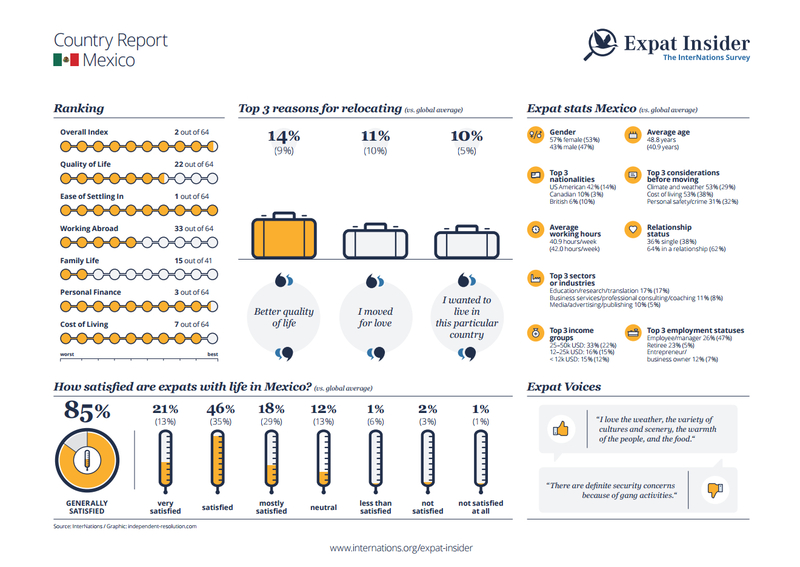 But on the whole, expats working in Mexico are not dissatisfied — 73% said they were generally satisfied with their jobs. However, the state of the economy was a concern for nearly a third. 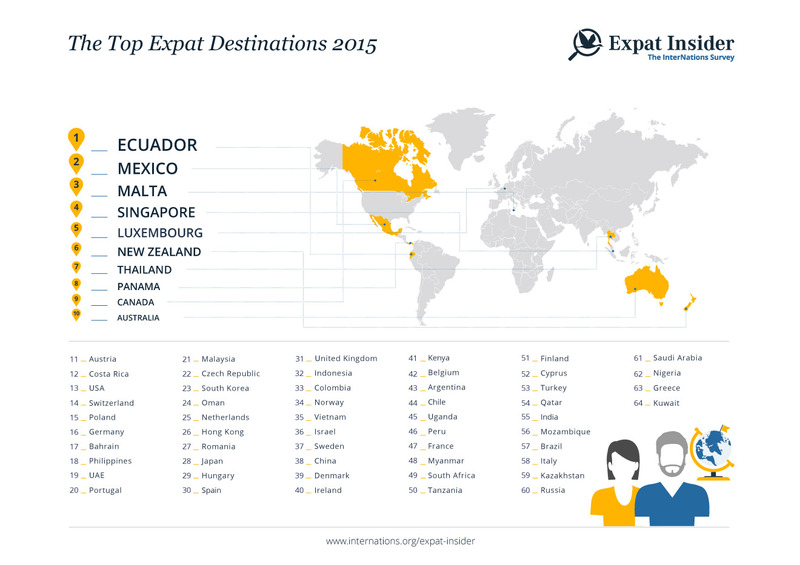 The top three nationalities of expats in Mexico are American, 42%, Canadian, 10%, and British, 6%. Retirees constituted 23%, and the average age is 48.8 years. The survey was conducted online in February and March by asking participants to rate diverse aspects of life. The study also revealed there were 10 types of expat, ranging from people who had relocated for employment to those looking for a better quality of life. Other high rankings were Panama, which placed eighth; Canada, in ninth; Costa Rica 12th; and the United States 13th.